Back in August of 2016 I blogged about Planetary change: What we are doing to the oceans. Direct experience drives human perception and cognition. We react to what we see and hear. What we think about the world is shaped by those aspects of our planet that can be observed. We note volcanic eruptions and earthquakes. We see and hear and are touched by more and more violent weather. We indirectly experience, via the media, the loss of wildlife to gruesome acts of poaching for profit. Some of us even experience the rising seas. But we do not normally experience or think about what lies beneath the planetary surface. 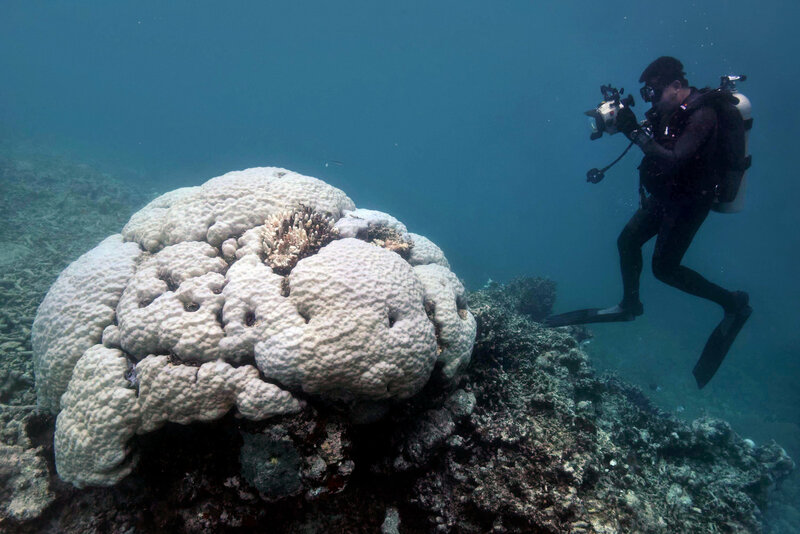 The New York Times features research showing that Large Sections of Australia’s Great Reef Are Now Dead, Scientists Find. … In poorer countries, lives are at stake: Hundreds of millions of people get their protein primarily from reef fish, and the loss of that food supply could become a humanitarian crisis. And what are we humans doing about damage we bring to our oceans? The answers range from nothing to making the problem worse.